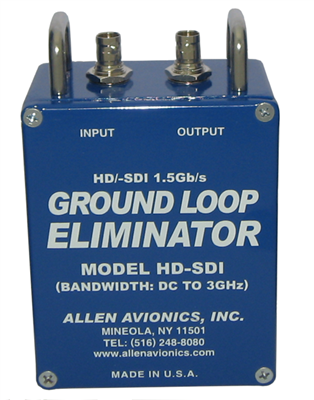 High frequency ground loop eliminator designed for use with High Definition Broadcast chains. These HD-SDI ground loop eliminators can be used for signal transmissions at 1.485Gbps over a cable contain a range of low to high frequencies. The HD-SDI Ground Loop Eliminator supports the four transmission rates of SMPTE 259m and SMPTE 292m 1.485Gbps HD SDI. Supports all transmission rates of SMPTE259m and SMPTE292m. Up to1.50 Gbps HD SDI.